Pictured are (back, from left) Camille Felder, Lucy Clement, Gabrielle Morris; (front) Ramey Hogue, Erin Hederman, and Camille Couey. 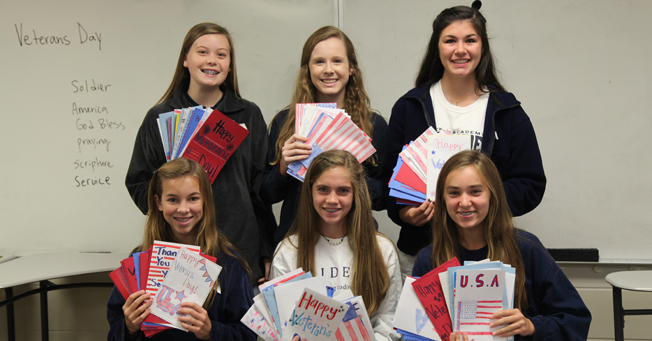 Interact Club leaders organized a campaign in the Middle School to create cheerful cards for the veterans at the VA Hospital. The students made over 200 handmade cards. The cards were delivered to the hospital, and enough were made to place a card in the chair of each veteran before today’s Veterans Day program.